Last week we got wind that a big announcement was due this week ahead of the UK Toy Fair which UK NERF will be attending on Thursday. If I'm honest I was a little sceptical, assuming that it would be official news about one of the N-Strike pistols that are coming out of the woodwork. Introducing the NERF Rotofury (formally known as the 'Bezerker', a better name in my opinion). Some of the US blogs including Foam from Above were the first to get the info which has been spreading like wildfire. We still only have the one image and the usual PR spiel that Hasbro hand out but for the first time we can get a good look at this beastie and find out a bit more. First off, the drum holds 10 darts making it the highest capacity MEGA blaster ever. Some say this isn't enough for a blaster that will be a primary but since it's front loading, I don't think this'll be too much of a problem since you can reload on the fly. We now know that it is a semi-auto springer and that it has slamfire. This can only be a good thing. There are too many flywheel blasters screaming around at the moment so it's nice to have something a little more civilised. From the picture, it looks an awful lot like the Vortex Revonix 360 which proved to be a favourite for MerryUnBirthday. The shape and form of the blaster looks pretty neat and I have to say, I kinda like it. However, I do have one major reservation. Ever since the launch of the MEGA Centurion, I have been something of a closet fan of MEGA blasters. Many people have bashed MEGA for being oversized and expensive and whilst I tend to agree on the latter point, for me the former is part of the charm. When I first opened my MEGA Centurion, nothing could wipe the big stupid grin off of my face. It was huge! It instantly transformed me into the little boy I was when I got my first blaster. Even through all of the chewed, mangled darts, I couldn't help but love the ridiculous size of the blaster. I had the same feeling towards the MEGA Magnus and more recently, the Cycloneshock. To sum it up, I like my MEGA... well, mega. Huge great bulky instruments of foam warfare that could shoot foam darts or be used as a battering ram. Not only does it make me feel like a kid again, but it also made it feel like these blasters were designed for us adults. So my initial concern with the Rotofury (apart from the new name) is about it's size. Is it not a little... small? If it is as the picture suggests, a similar size to the Revonix 360 I will be devastated. Even the recent Bigshock (essentially a MEGA jolt) was unnecessarily large and I am worried that Hasbro have held back on this bad boy. 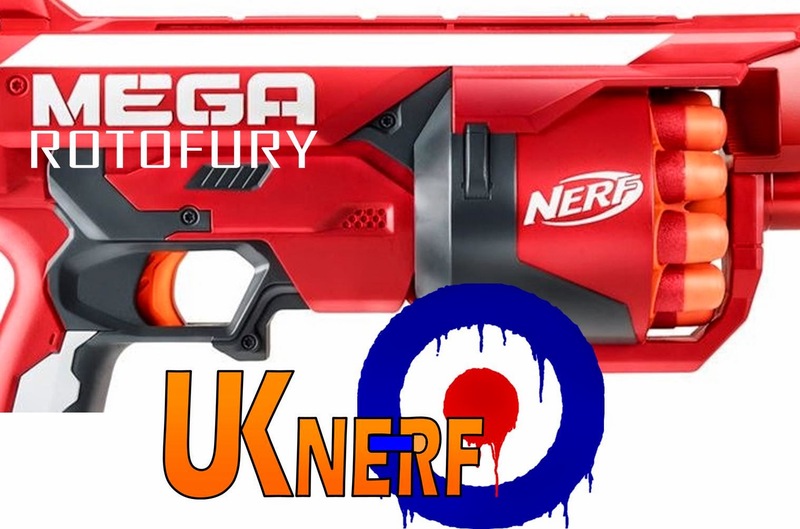 As you may be aware, UK NERF will be attending the 2015 London Toy Fair in 2 days time. We hope to get hands on with this blaster so we will have to see if it tickles me in person.